My oldest son just got married a few weeks ago. His wedding was on the beach in Hawaii. That trip was not just a vacation, I had to look amazing. After all, I am the mother of the groom, and there were many photos taken. 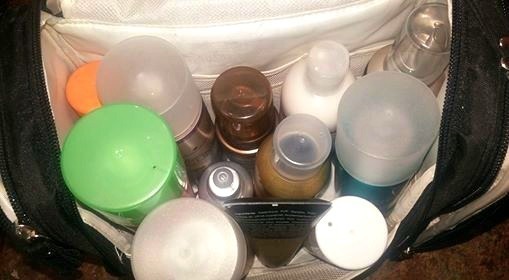 Therefore, I had to bring many, many beauty supplies, which included: all of my makeup, shampoos, conditioners, curling irons, body lotions, facial care and hairspray, just to name a few. Having any of these items spill in my suitcase was a huge fear of mine. 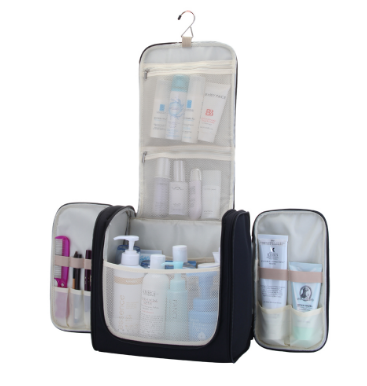 Thankfully, I discovered the MelodySusie® Hanging Waterproof Toiletry Bag, which helped to keep my beauty products and toiletries organized and easy to find. It is so hard to get ready in a hotel bathroom without much counter top space on which to place all of my beauty supplies. I was so thankful that my MelodySusie® Hanging Waterproof Toiletry Bag could hang on the back of the hotel bathroom door! It made everything so much easier for me when I was getting ready for the big day, plus, I always knew right where everything was, including my razors, toothbrush and even my vitamins! Below is a peek into my bag, but what you see is not even half of what I was able to fit into this amazing toiletry bag. It has so many pockets and places to store everything! Lotions and potions and sprays, oh my! 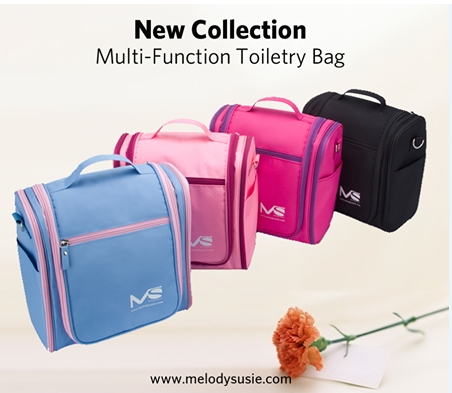 MelodySusie® Hanging Waterproof Toiletry Bag is a perfect choice to neatly organize your personal necessities for outdoor activities, such as travelling on holidays, business trips, camping and seashore activities etc. LARGE CAPACITY FOR STORAGE -- Made with high quality durable 300D Polyester and provides 23 compartments in different sizes with smooth zippers. WATER-RESISTENT FUNCTION --- Designed with internal waterproof function that you never have to worry about moisture penetration. SPECIAL HANGING AND CARRYING DESIGN --- A handy top hook allows for securely hanging from a shower or towel rack. A reliable loop handle and an adjustable shoulder strap allow for comfortable carrying in different ways. 12 MONTHS WARRANTY COVERAGE - All MelodySusie® Hanging Waterproof Toiletry Bags are covered by warranty for 12 MONTHS.